Gastric cancer is the fifth most common cancer globally and is the second highest cause of cancer related deaths, mostly due to patients presenting with advanced disease. The majority (>90%) of gastric cancers arise from the gastric mucosa as adenocarcinomas. The remainder are a mixture of connective tissue, lymphoid or neuroendocrine malignancies. In this article, we shall look the risk factors, clinical features and management of a patient with gastric cancer. In many Western countries, rates of gastric cancer have fallen dramatically in the past few decades (mainly due to an improved diet and treatment of Helicobacter Pylori infections), however it remains extremely common in Far Eastern countries, such as Japan and Korea. The major risk factors for developing gastric cancer include male gender, H. pylori infection, increasing age, smoking, and alcohol consumption. Other risk factors include salt in diet, positive family history, and pernicious anaemia. The most important modifiable risk factor identified in developing gastric cancer is infection of the stomach mucosa by Helicobacter Pylori. 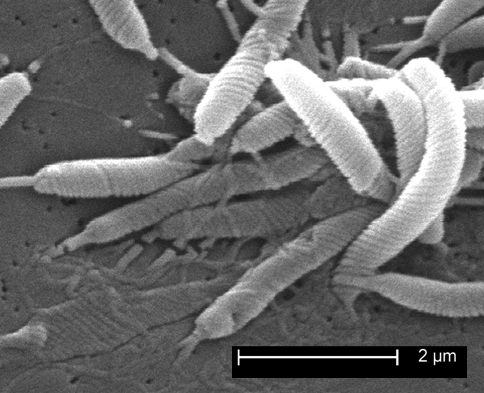 H. Pylori is a Gram negative helical bacterium that produces the urease enzyme, acting to break down urea into CO2 and ammonia. The ammonia neutralises stomach acid, allowing the bacterium to create an alkaline microenvironment. It subsequently sets off a cycle of repeated damage to the epithelial cells, leading to inflammation, ulceration, and ultimately gastric neoplasia. The risk of gastric cancer is nearly six times higher for H. Pylori-infected than for uninfected individuals. However, whilst around 60% of the world’s population are infected with H. Pylori, less than 0.5% will develop gastric adenocarcinoma. The symptoms of gastric cancer are frequently vague and non-specific*, with patients often unfortunately presenting at an advanced stage. Non-specific cancer symptoms (anorexia, weight loss, or anaemia) are markers of late stage disease. NICE guidelines recommend referring for an urgent OGD for any patients presenting with new-onset dysphagia or aged >55 years presenting with weight loss and either upper abdominal pain, reflux, or dyspepsia. On examination, an epigastric mass may be felt but clinical signs are usually completely absent, especially in the early stages. *In the UK, only 40% of patients with gastric cancer are diagnosed via the urgent pathway, the rest are diagnosed after a non-urgent referral, an emergency hospital admission, or were referred by another hospital specialist. Gastric cancer often presents with non-specific symptoms and consequently there are a wide range of potential differential diagnoses. Important diagnoses to consider include peptic ulcer disease, GORD, gallstone disease, and pancreatic malignancy. Any patient presenting with clinical features of gastric cancer, including haematemesis or melena, will warrant urgent routine bloods*, including a full blood count and liver function tests. The primary investigation of any suspected gastric cancer is an urgent upper GI endoscopy*, allowing for the direct visualisation of any malignancy present (Fig. 3) and subsequent biopsies taken as needed. *A CT scan may show thickening of the gastric wall but does not allow direct visualization or biopsy, hence OGD is the only definitive means of diagnosis. For staging and in order to plan treatment, all patients need a CT Chest-Abdomen-Pelvis* and a staging laparoscopy (to look for peritoneal metastases), the most commonly used staging system for gastric cancers is TNM staging. *As gastric cancers are not very “PET avid” (do not take up the radioactive tracer well), PET scans are rarely used in staging gastric cancers. All patients should be discussed at a specialist upper GI cancer multi-disciplinary team meeting. Ensuring adequate nutrition is essential, therefore each patient should undergo nutritional status assessment and be reviewed by a dietician as necessary. Many patients need formal nutritional support, both pre- or post-treatment, via a NG (nasogastric) or RIG (radiologically-inserted gastrostomy) tube. The mainstay of curative treatment for gastric cancer is surgery. Patients who are fit enough should be offered peri-operative chemotherapy (3 cycles of neoadjuvant and 3 cycles of adjuvant*). The most commonly used method in reconstructing the alimentary anatomy is the Roux-en-Y reconstruction as it gives the best functional result, in particular with less bile reflux. 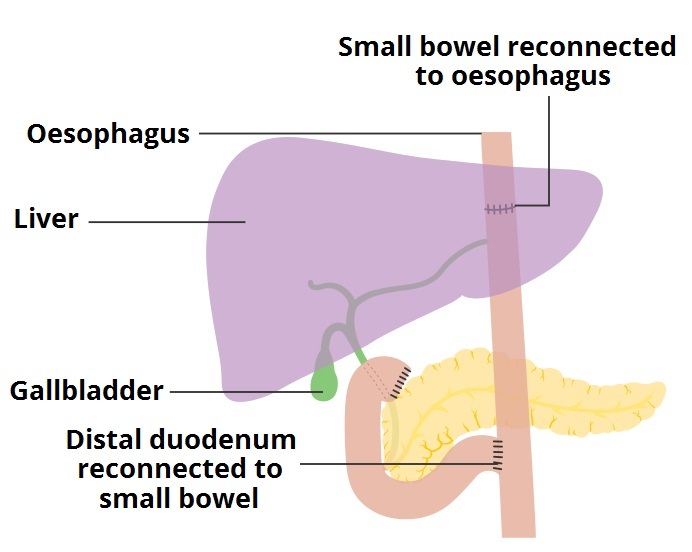 Post-gastrectomy, distal oesophagus is end-to-end anastomosed directly to the small bowel, and the proximal small bowel is end-to-side anastomosed also to the small bowel (Fig. 4). Patients with early T1a tumours (tumours confined to the muscularis mucosa) may be offered an Endoscopic Mucosal Resection (EMR). This has the advantage of a greatly reduced morbidity, mortality, and quality of life impact, however is only used in early tumours therefore current use in clinical practice is rare. *This based on the MAGIC trial which showed a 13% 5-year survival advantage in patients who received peri-operative chemotherapy compared to those who underwent surgery alone. The chemotherapy regime used was epirubicin, cisplatin and 5-FU (ECF). 5-FU is usually replaced by its oral form, capecitabine. Gastrectomy is a major operation. Mortality rates remain between 2-5% and quality of life remains poor for up to 6 months after surgery. Specific complications include death (3-5%), anastomotic leak (5-10%), re-operation, dumping syndrome, and vitamin B12 deficiency (patients need 3-monthly vitamin B12 injections). Unfortunately, most patients will be offered only a palliative approach due to the extent of disease at time of presentation. This may include chemotherapy, best supportive care, stenting (for patients who have gastric outlet obstruction secondary to an obstructing cancer), or rarely palliative surgery. Palliative surgery (usually distal gastrectomy or bypass surgery (a gasro-jejunostomy)) is best used when stenting fails or is not available. It can also be used cautiously in the palliation of bleeding gastric tumours. The main complications of gastric cancers are gastric outlet obstruction, iron-deficiency anaemia, perforation and malnutrition. The 10-year survival rate for stomach cancer overall is 15%, although this is stage-dependent. Most gastric cancers will present at an advanced stage with metastasis, which have a 5 year survival of <5%. Which of the following is not considered a risk factor for gastric adenocarcinoma? What is Troisier's sign of malignancy? Which of the following imaging modalities are rarely used in the investigation of gastric cancers? What is a main complication following gastrectomy?